Available this month in high resolution at Patreon.com for Jenny's patreons. On the naming of a new species of harvestman found in a cave in Brazil, Iandumoema Smeagol. Stephen Colbert, host on The Late Show, criticised the naming of the harvestman, showing the limits of his Tolkien knowledge in the process. David Bratman is careful to point out where Mr Colbert is wrong. Incidentally, it seems that there will be no RingCon in 2016. 3 January 2016, International, ‘Tolkien Birthday Toast 2016’, The Tolkien Society – save the date!! 18-20 July 2016, University of Bamberg, Bavaria, Germany, ‘International Conference on Medievalism – 2016: Tradition or Myth’, International Society for the Study of Medievalism –: I am not sure if there will be anything specifically Tolkienian at this conference, but looking at the theme of the 2016 conference, I would very much expect that Tolkien will be mentioned ... more than once. A doctoral dissertation from the University of Oulo, which “discusses constructive mythopoetics in J. R. R. Tolkien’s legendarium, the mythopoetic logics and elements on which Tolkien’s texts and his fantasy world are constructed. I would love to have been able to say more than what is in the readily available abstract (see the linked site above), and the full dissertation can indeed be downloaded from this site, but my time has not allowed me to go through the dissertation yet. Reacting to the on-line publication of an essay by Ursula K. Le Guin (given as a talk in 2000), Robin Reid takes a look at the positive aspect of the critical (in the broad sense) treatment of Tolkien in particular and science fiction and fantasy in general. Both views are, in a sense, true, and neither aspect can be ignored in any attempt at a balanced treatment of the history of the critical and academic treatment. Make sure to also read the comments, which are unusually good. A translation of the poem into prose by Karl Seigfried. 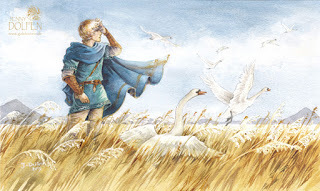 The poem is the basis for both Tolkien's own alliterative poem, The Homecoming of Beorhtnoth Beorhthelm's Son (which deals with the aftermath of the battle), and for his essay on ofermod. Having a modern translation and explanation readily available may be a good companion to the explanation available in e.g. Tree and Leaf. Bratman explains about a theory on the history of arts, a theory which he calls ‘the hidden city’. This post appears to be, at least in part, a reaction to the post by Robin Reid referenced above, with Bratman attempting a more balanced view. Following up on last month's news about a copy of the Middle-earth map annotated by both J.R.R. Tolkien and Pauline Baynes for the use of Baynes when she made her own Middle-earth map, here is a high-resolution transcribed version of the map. In this article, Norbert Schürer critiques current Tolkien criticism, claiming that “the field of Tolkien studies is in a sad state.” Having introduced the field as caught between two views of Tolkien (that are presented at somewhat opposing or inconsistent), “the difficult litterateur and the successful populist”, Schürer moves on to more specific criticism through the vehicle of exemplifying his views by exemplifying from seven recent works in the field. Naturally, Schürer's critical review has caused some consternation in Tolkienian circles, but without committing to a view of Tolkien studies as a whole, I have to agree with much of the criticism Schürer offers – we do see far too much criticism that is weak and undedeveloped; or doesn't enhance our understanding (or appreciation) of Tolkien or his work; or tries to monopolise Tolkien for a specific cause; or merely tries to use Tolkien to preach to the choir. I would also agree with Schürer that these problems are particularly prominent within the areas that he identifies. Part of the problem may also be that the field is not just an academic field – amateurs (including myself!) contribute to the body of Tolkien studies, and while some of this is on par with the best of academic work (I need only mention the likes of Christina Scull and Wayne G. Hammond), most is not. This sets up a situation where the larger field is bottom-heavy in terms of quality, which may influence also the academic sub-set of the field. Unfortunately this response in itself demonstrates some of the problems that Schürer points out simply by missing the point. This does not necessarily mean that the points the authors raise are false, but they do not address the criticism that Schürer raises. A pity, really, that a few brief lines should be elevated to the headline of an interview that is really about Atwood's own authorship. I do wonder which two of the female characters of The Lord of the Rings Atwood remembers – there are quite a few more than the two she remembers (besides Shelob). I have speculated about the conundrum of Tolkien's female characters; while commenters very often exaggerate (like Atwood), the gender imbalance is real (just see the statistics page at Emil Johansson's LotR Project site), and it seems to me that Tolkien often either idealises or trivialises his female characters, whereas the male characters (possibly because there are so many more of them) also get to show a more realistic kind of heroism. In his update to this post, Martinez makes the purpose of the post very clear: “to produce an article that would rank highly in search results for queries about Tolkien and Nordicism.” This purpose has been achieved – at the moment of writing (2015-12-13) the post at the top of the search results on Google and third on Yahoo and Bing. The post also puts a selection of Tolkien's actual words in a top-ranking search results, which is a good thing. It is a pity that this seems to have been achieved at the cost of a coherent and well-developed argument (he acknowledges himself that it is digressive), but such may be the needs of search-engine optimisation, of which Martinez is certainly an expert. Anna Smol wanted to post some of the images, she had used for her paper at the Tolkien 2005 conference, not least in relation to the current sale of the proceedings (see below). Smol of course also takes the opportunity to say a bit more about the topic, and to expand on parts of the imagery, invoking a medieval homage ritual. 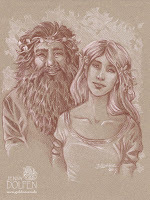 The proceedings from the 2005 conference, The Ring Goes Ever On is now being sold for only £10 from the Tolkien Society. In addition to the many excellent papers by respected scholars, one of the great things about such proceedings as these is that they bring together a large variety of approaches and perspectives on Tolkien and his work. This is well worth the price – including overseas postage! Jason Fisher's book (as editor), Tolkien and the Study of His Sources, has been reviewed in The Journal of Inklings Studies (Vol. 5, No. 2, October 2015). What Fisher finds surprising is a combination of a very well-written review and it being written by an unknown undergraduate. 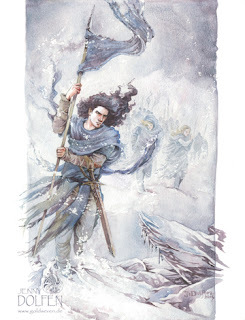 Like Fisher, I will look forward to, hopefully, seeing more work in and on Tolkien studies from Faith Liu. Regular readers will know that I have discussed this book previously – not because I have read the book, but because I have read what the authors have written on-line, describing their work and conclusions. Based on this, I have not been kind, but have accused the authors of trying to press-gang Tolkien into supporting their own political agenda. Having said this (perhaps even repeated it too often), I admit that I am thankful to see that conclusion shared by John Rateliff in this review of the actual book. He does find som small lights in the darkness (my phrase), but these seem unrelated to the points the authors wish to make. This is not Tolkien research, or Tolkien studies, or Tolkien scholarship of any kind – this is mere political propaganda attempting to hijack Tolkien (again, this is my phrasing, not Rateliff's). On the arrival of the book, Approaches to Teaching Tolkien's The Lord of the Rings and other works edited by Leslie Donovan. Smol has an essay in part two of the book, but she also provides an overview of the contents as well as scans of the full table of contents. Very interesting book!
. This time John Houghton has reviewed the recent Tolkien's Intellectual Landscape by E.L. Risden. Despite a few weaknesses, Houghton finds the book “easy to commend” and is “glad to own” it. An excellent review, and certainly one that puts the book on to my wish list. Announcing volume 5 of the journal and listing the contents, while noting pieces with a direct relation to Tolkien. The latter category includes works by Nelson Goering (on the metre of three of Tolkien's alliterative poems) and William Simpson (on Saruman's science), and the review by Faith Liu of Tolkien and the Study of His Sources mentioned by Jason Fisher (see above). Wayne Hammond reviews the new edition of The Oxford Companion to Children's Literature. In addition to more general comments (and citing other reviews), Hammond comments more extensively on the entries on Pauline Baynes, Arthur Ransome, and J.R.R. Tolkien, all of whom Hammond is an expert on. Reporting, quoting, and paraphrasing the current Rawlinson and Bosworth Professor of Anglo-Saxon, Andy Orchard, this article summarises from a talk Orchard gave in Toronto on ‘Tolkien’s Beowulf and Lessons from History’ where Orchard called Tolkien's prose Beowulf, which was published last year, ‘a horrible, horrible, horrible translation’, while insisting also that the notes published alongside Tolkien's translation are ‘brilliant’. Jane Johnsen has, among many other things, been at George Allen & Unwin Publishers, where she became the editor with special responsibility for the Tolkien list. In this interview, she describes her career, including a number of experiences with more or less direct relations to Tolkien. This must surely be Bilbo leaving Bag End and saying goodbye to the old wizard. 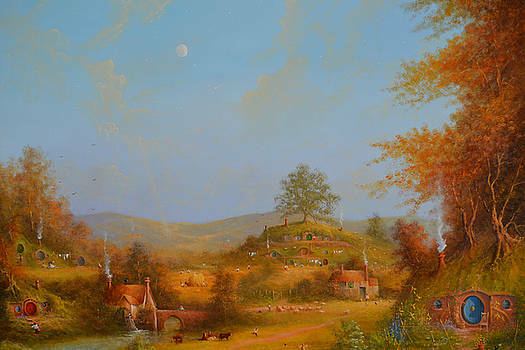 I rather like the mixture of the familiar Shire-holes with something else in this picture, though I am not entirely sure what Middle-earth location it is supposed to depict ... presumably somewhere in Bree-land. 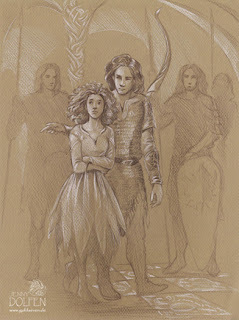 And illustration of a scene from Tolkien's Lay of Aotrou and Itroun. 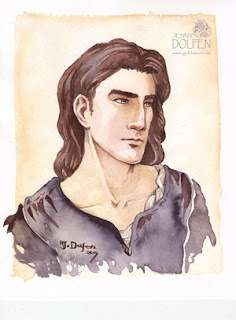 It is absolutely wonderful to see illustrations of more of Tolkien's non-Middle-earth works. Thank you, Ted Nasmith, for this! Gandalf and Bilbo in the Shire. The large printing of Tomás Hijo's Battle of the Pelennor Fields is now available ... it certainly looks a wonderful piece of Tolkienian art! This post by Dimitra Fimi is so crammed full of all kinds of good stuff that I couldn't decide where to put it, and therefore it has ended up here. 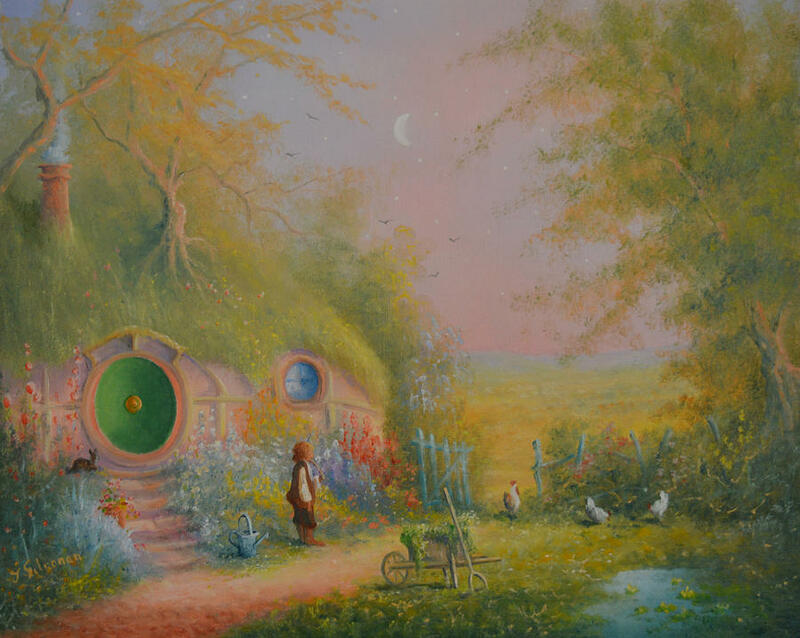 The post summarises Fimi's own recent activities as well as the more significant events in academic Tolkien studies in the autumn of 2015 – conferences, papers, books, articles and more. A must read summary! Some interesting bits about the sense of identity and place in Tolkien's work with particular emphasis on the idea of Britain. This has, of course, been around for a while, but I wanted to recall it to everyone as it is a most excellent resource for searching for papers on Tolkienian matters. Lots of very good inforamtion about current books, topics, news and events! I will surely be visiting this site more often for the amazing content!